I hope you will enjoy the following discussion and beautiful images of Amy's Mosaic Frames. She has found a perfect niche. Her unique Mosaic Frames are so special for Wedding, Shower, New Baby, Birthday, or Anniversary Gifts. Also an exciting gift for yourself to frame a favorite family photo! 1) Amy, when did you become interested in art? Did you study in school or are you self-taught? 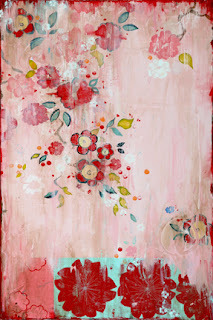 For as long as I can remember, I have enjoyed art as a Fine Craft. I have a degree in Graphic Design and Illustration but my favorite things to make are crafty things: I like to quilt, cross-stitch, rubber stamp cards, make holiday décor, and Halloween costumes for my kids when they were young, decorate fancy birthday cakes, make jewelry, etc. I always have some kind of creative project going. 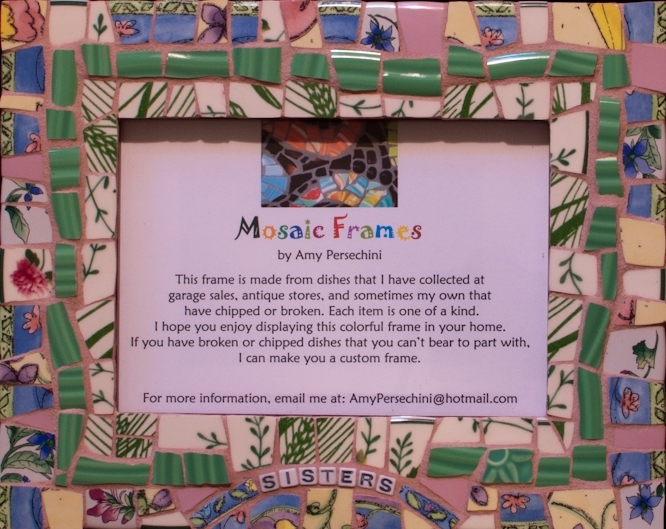 2) You work in mosaics, which fascinates me. When did you gravitate to that genre? I have always been attracted to mosaic art. Perhaps this love started back when I was a little girl. I spent my summers in Mexico. I remember my mom taking me to a neighborhood park that had large sculptures, covered in mosaic tiles. I always loved going there. I was able to climb those sculptures. Perhaps if I went back now I would find those sculptures quite small, I don’t know, but when I was little, they seemed like enormous, magical, Dr. Seuss-like shapes that I really loved! Mexico in general has mosaic art everywhere and I imagine that had an influence on me, too, as I spent so much time there growing up. 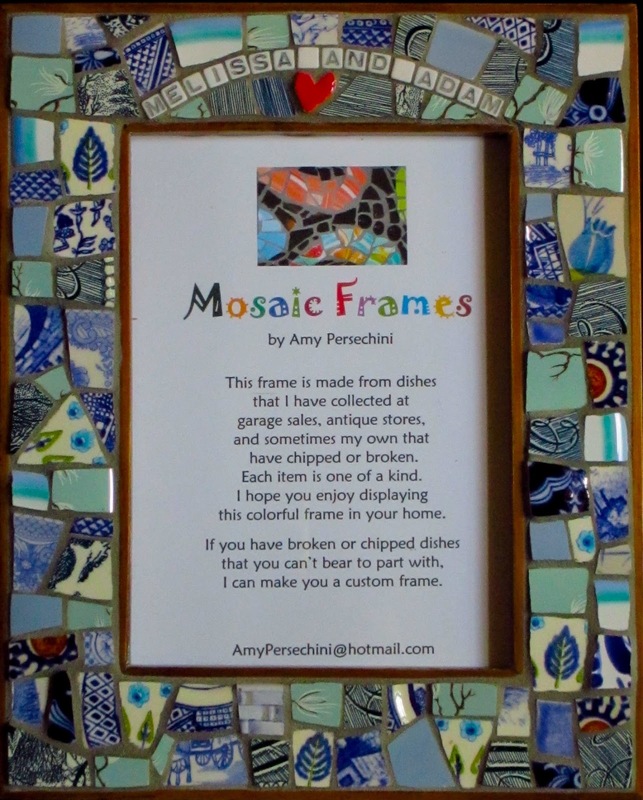 I first started to mosaic shortly after moving to Overland Park. A lot of dishes broke in the move here from Rochester, NY and I thought I just had to do something with those broken dishes. 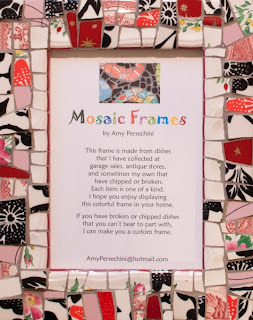 I noticed a shop here in town that one could go to and learn to mosaic. I had never seen a place like that before. I went, took a lesson, and was hooked! This was back in 2002. 3) Your mosaics are different than many I have seen. Would you tell us about that? What special tools are required? 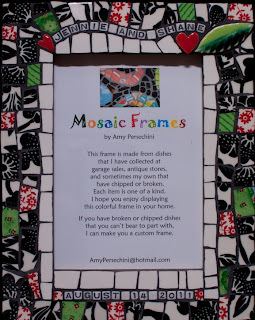 I really like using a mix of dishes and small tiles when I make my picture frames, something I have become somewhat of a specialist in as I have made so many! 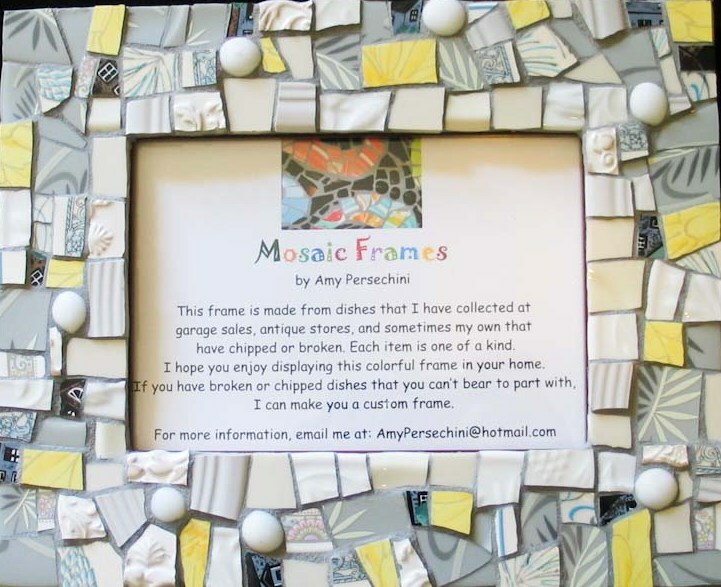 I like the idea of using chipped or broken plates, recycling of a sort. 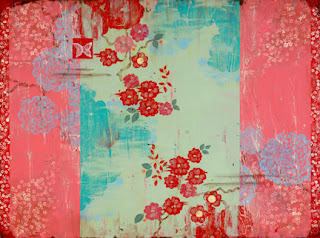 I also like mixing patterns and colors. 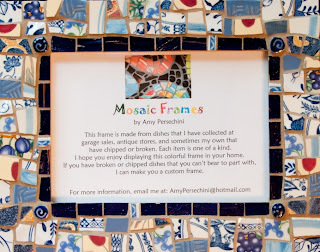 Mosaic to me is sort of like quilting with dishes. My tools are very simple: a tile nipper and liquid nails and a file to smooth rough and sharp edges. 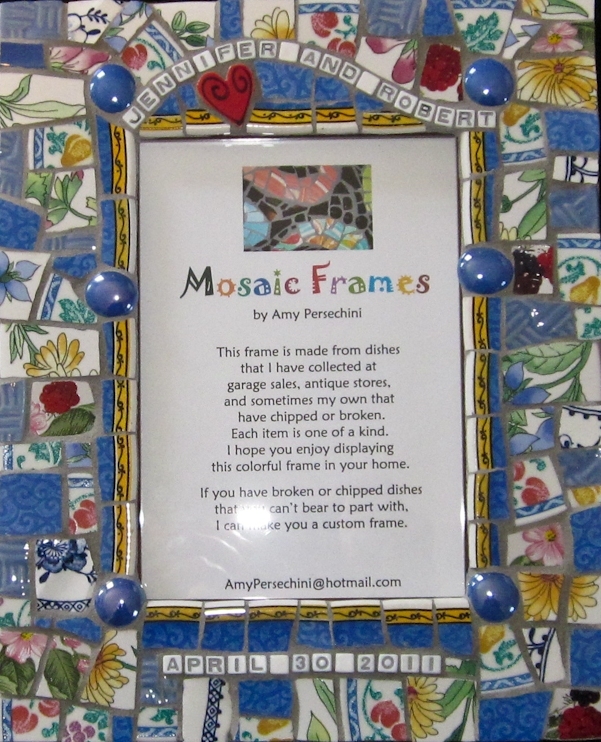 4) It does take a special artist to work in intricate design, such as mosaics and jewelry. Do you find it challenging to have the patterns of color; shapes and all sizes come together? I have gotten more meticulous with my frames over the years, really trying hard to fit the pieces together as tightly as I can. 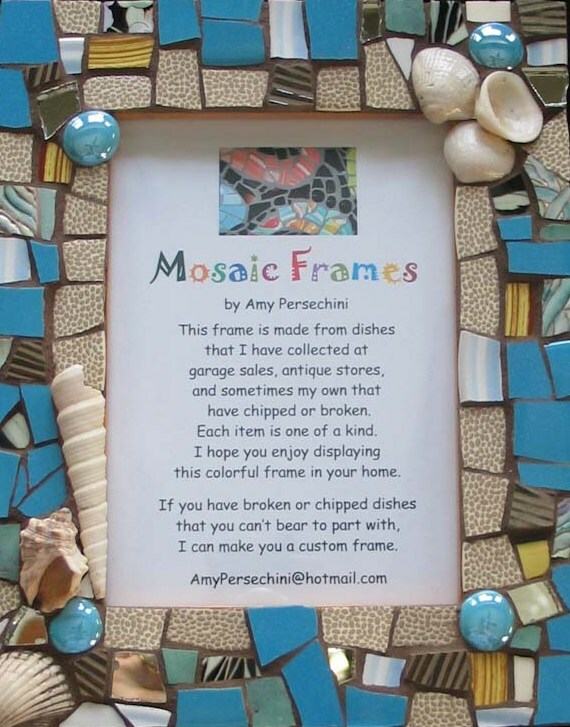 I have seen beautiful mosaics that are done in a whole different style. I feel like anything goes and anything is pretty attractive when it comes to mosaic art. I really don’t find it hard, just time consuming. And I also find mosaic work to be my therapy. 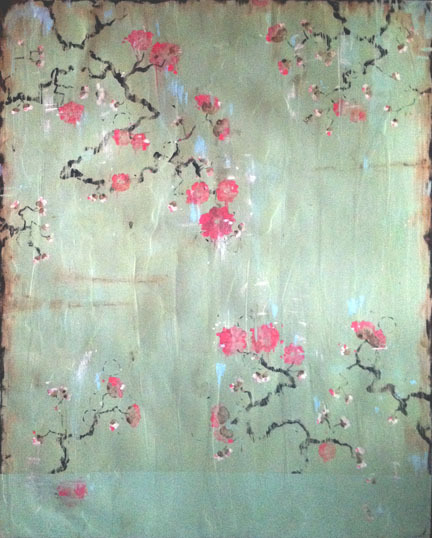 5) Your special commissions are also very memorable. How did you emerge in that area? My frame business has come about mostly by word of mouth. I started making frames as gifts and then people who I gave them to, started ordering them. I have had them in several shops from time to time but mostly I just sell them to people who ask. I don’t have a website so my business is pretty small at this time. 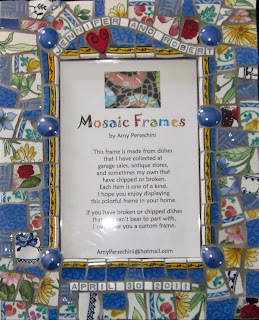 6) Who if any artists have influenced your work in mosaics. Have you had mentors along the way? 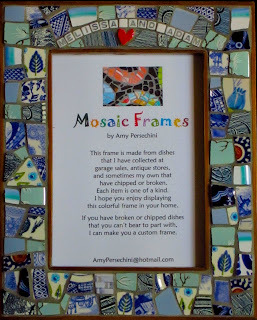 I don’t think I have been influenced by any specific mosaic artists but rather by the people I met over the years when I would go and work at the two mosaic shops that were in town for a while. Sadly, both have closed now. But the creativity I saw from other people’s work was amazing and inspiring. 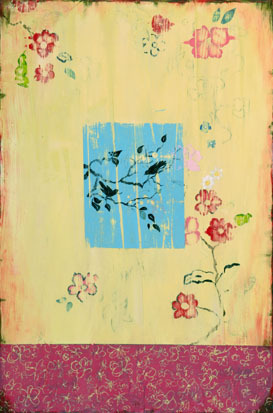 7) What words of wisdom or advice would you give a new or emerging artist? If it is something you love to do, just do it, make your art. It is an art form that pays for itself with a little profit and that makes it worthwhile to me. I think for a person that is really driven to make art their career it can be done with passion and persistence, and knowing the right people to help you get your work out there and exposed would probably be really helpful too! 8) If I wanted to order a frame from you, what should I know? 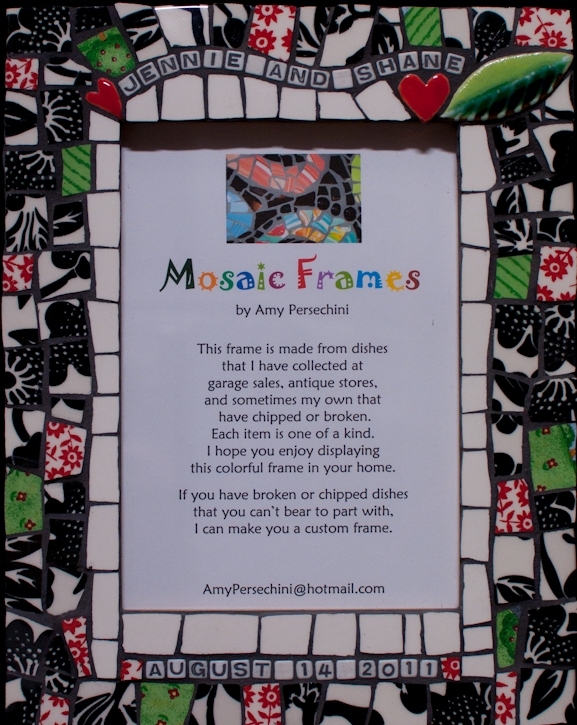 I would be very happy to make a custom frame for you. I can put special words on the frame to personalize it for a wedding or new baby, a birthday, a sentiment. 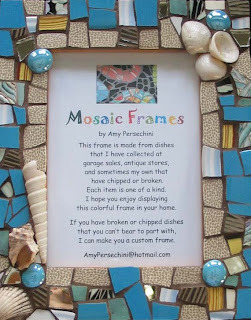 Or, I can just mosaic the frame with no words. I sometimes have customers that would like me to use their own plates that have special meaning to them, maybe grandma’s dishes or the plates they grew up using, etc. I like to have an idea of colors, maybe 3. I use that as a guide. I need to know orientation, vertical or horizontal, if using words. 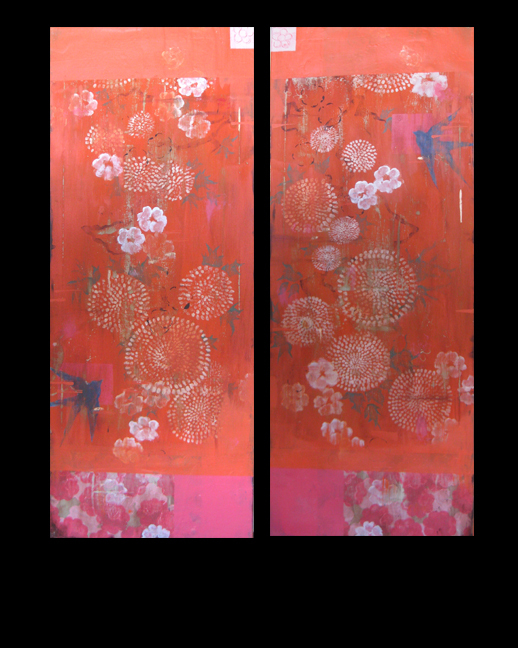 I need the customer’s trust in my own creative ability to create something beautiful. I have no idea what the end result will be, my designs are not preplanned. I gather up the dishes and start cutting and putting together! 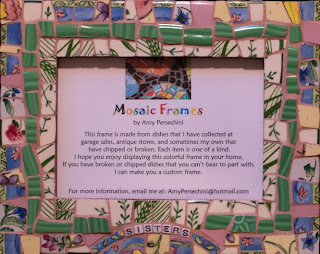 Thank you so much to Amy; I know that she would love to hear your comments. and of course take any special orders from you. 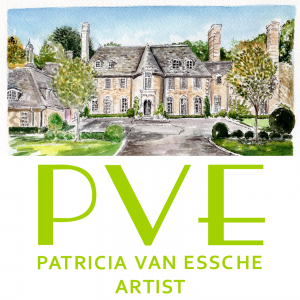 Thank you to all of my readers who continue to support the arts through my site and other charitable contributions. There is no fine, well rounded society without the arts available in every form! 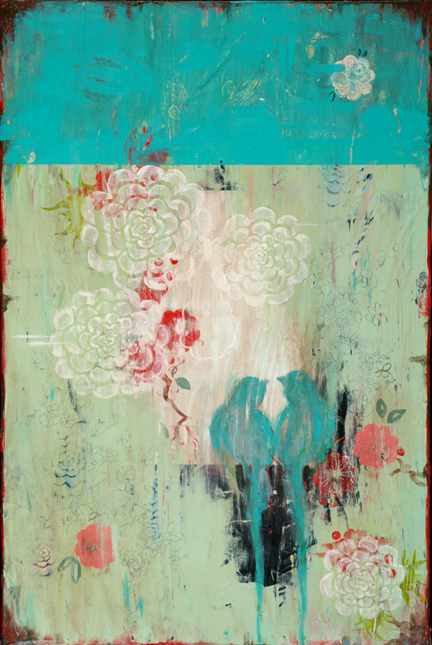 Look for another Fine Art Feature coming up shortly! The Winner of The Velvet Pumpkins Giveaway! We have a winner of the latest Giveaway, the gorgeous Velvet Pumpkins in the Fall Jewels Trio from the Love Feast Shop! It is Cindy Austin of Cindy's Fractured Fairy Tale Blog. Cindy. 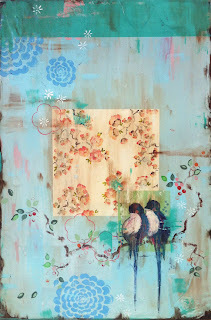 who is also an artist has the website, The Simple Things featuring wonderful oil paintings and she takes commissions. Please be sure to visit her sites! Congratulations to Cindy! Please contact me with your mailing info at Kalbert1@kc.rr.com. I know you will love the luxury of these special velvet pumpkins with their artistic stems! To my special friends and family, I can never thank you all enough for your prayers, love and encouragement ! Watch this week for a new 2012 Artist Series Feature and Interview which I think you will really enjoy! So much creativity out in the world of art! Autumn has arrived and along with it the flaming leaves, the fall scents and rich colors! I am sure many of you remember seeing the gorgeous velvet pumpkins with unique real stems by Love Feast Shop! Love Feast is giving away a trio of plush velvet pumpkins in the Fall Jewels Collection. 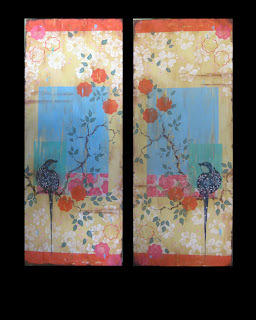 They look fabulous on a mantle, hearth, a table centerpiece, etc. The Fall Jewels trio of Plush Pumpkins includes the colors Royal, Spice, and Cinnamon. I think they are so, so beautiful! Here is a close up of the Royal Color. Look at that stem and the folds in the velvet! 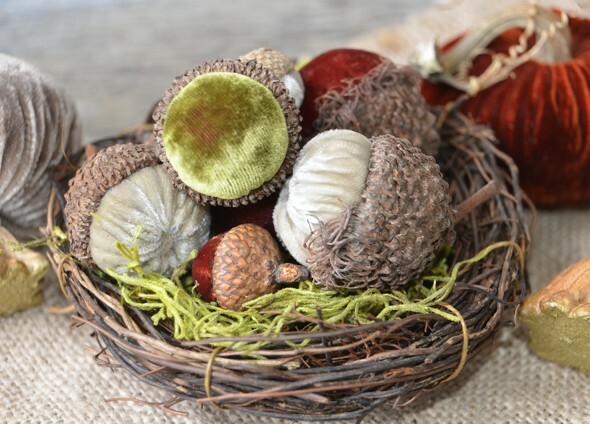 All of the Velvet Pumpkins, Acorns and Mushrooms are meticulously hand-stitched and handcrafted out of natural organic stems and luxurious velvet fabrics and made in the USA! 2) If you tweet, post on your site, OR on Facebook about this Great Giveaway you get 3 extra entries! If you do ALL 3, tweet, post, put on Facebook you get 5!! yes 5 extra entries! Thank you all for your support and encouragement ! 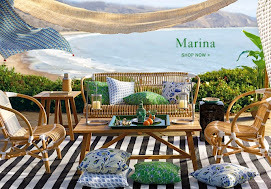 I am so honored to announce that I was the chosen winner of a $500 Gift Card to Home Goods offered from Paloma of La Dolce Vita. I cannot thank you enough! Trust that it will be put to good use!